Mawa Kachori is a very well known Rajasthani sweet. Jodhpur is famous for its Mawa Kachoris. 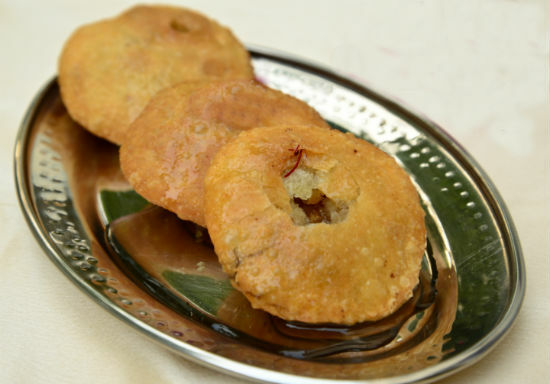 Rich dry fruit and mawa (khoya) stuffed crisp deep- fried kachoris are coated in sugar syrup. You can even drench it with cardamom and saffron infused sugar syrup for a really special experience. Traditionally, making mawa kachori is a time intensive and long procedure, but with our short cut method it is a breeze and far tastier than store bought. Its very similar to khasta kachori, only the filling is sweet. Sunflower oil Or Ghee for deep frying. Crumble and mix all the mithai in a bowl, add the chopped nuts, nutmeg powder, crushed cardamom and saffron. Mix everything nicely. In the meantime make the crust. Take the flour, salt, ghee and mix in a bowl. Add warm water little amount at a time, not add to much at one time. Kneed well to make a firm dough. The dough should be little tighter than the Chapati Dough. Apply few drops of oil on the dough and cover the dough with a clean plastic wrap. Leave the dough for aside for 10 minutes. Take the sugar, water and cardamom in a sauce pan and put it on high heat. Let the mixture to boil and turn off the heat. The syrup is ready now. Make 6 equal portions of the Dough. Make 6 equal round balls of the Stuffing too. Take each portion of the Dough, roll them to make a small circle, put 1 Mava ball in the center, pull the edges of the dough to wrap the filling. Make sure that it is sealed completely. Press the Kachoris on the top to flatten the Kachoris. Make the rest and keep aside covered with clean plastic wrap. Take a deep frying pan, add enough oil/ghee in the pan, put on low heat. Add 2/3 Kachoris into the oil, and fry till the Kachoris become nice golden in color. Kachoris must be fried in warm oil to make crispy. So remember to make your oil warm not hot. And do not add more than 2/3 at a time. Take each Kachoris out of the oil/ghee and put onto a paper towel. Fry rest of the Kachoris in the same way. Before serving, make a small hole and drizzle some syrup in and garnish with chopped Pistachios and saffron strands. This is a tried and tested recipe. Have also stuffed boondi laddoos in the kachori when that was the only mithai in the fridge. Would you try this recipe?